Hurtta Outdoors Slush Combat Suit is a premium quality, all in one suit designed to protect the body and legs by covering the dog from head to tail and all four legs. 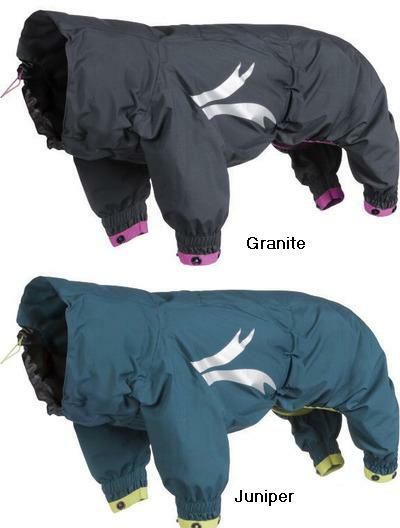 As well as being comfortable for your dog it is made from strong but light high performance material which is windproof, waterproof and dirt repellent. The Combat Suit has standard leg lengths and the bottom of the legs can be tightened while the neck and waistline are adjustable to create the perfect fit. There is a two way zip and leash opening on the back, as well as 3M reflectors to make your dog more visible in the dark. The Combat Suit can be left on and your dog will still be able to do their business. Please see below for size guidelines. The recommended breeds on the list are for reference purposes. The sizes of the dogs may vary greatly between individuals. There are currently no questions for Hurtta Outdoors Slush Combat Suit for Dogs - be the first to ask one!